The latest assessment phase to see you at age 45, commenced in April this year. An information pack was sent out earlier in the year containing everything you need to know about the Age 45 Assessment Phase, and this information and other documents are available here. If you did not receive your pack, please get in touch with us.The age 45 assessment includes the Brain Imaging (MRI) Study. 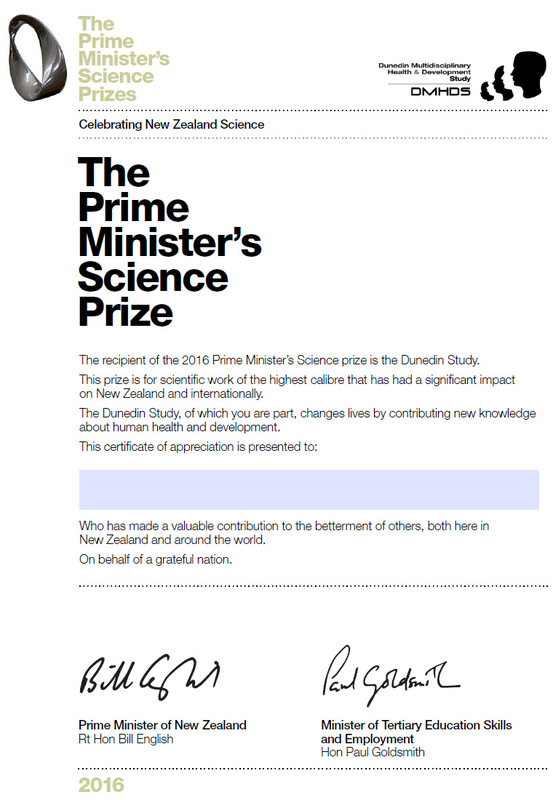 This is an exciting new addition to the Dunedin Study. The Next Generation Studies have also resumed, and if you have a child turning 15 or 16 within the next 12 months, we may also soon be in contact with you to see if you and your teen are interested in participating. If you have recently moved or changed your contact details, please phone or email us to ensure you receive the information package. Alternatively, please complete and return by email the contact information form so we can update your details. 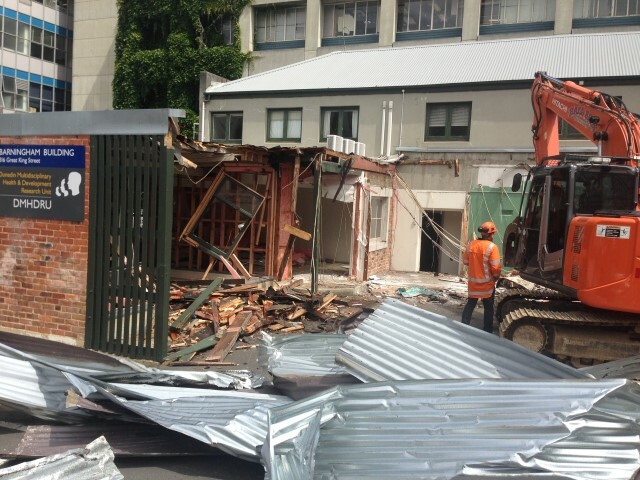 Demolition of the Barningham Building commenced on 16 December 2015 to make way for the new Dental School redevelopment. 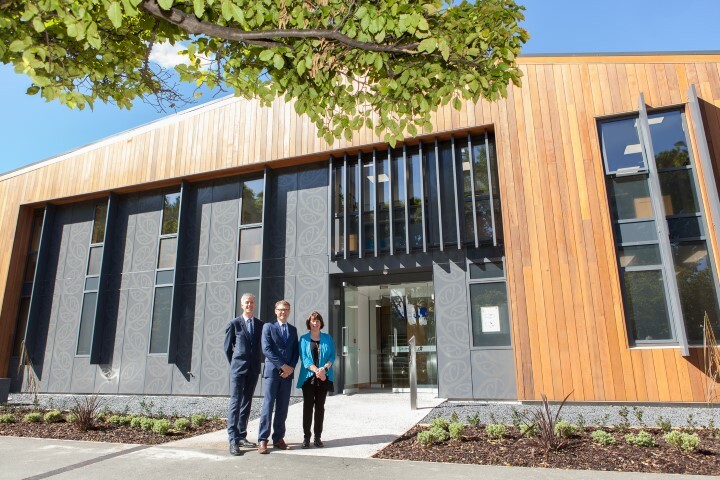 At long last the Dunedin Study has its own, purpose-built building which was officially opened on 25 January 2017 by Tertiary Education Minister, the Hon. Paul Goldsmith. The new building, on the corner of Union Street and Anzac Avenue, is designed, first and foremost, with Dunedin Study members in mind. Because Study members’ identities are never revealed, the building has a private entrance, private parking, and a discreet street façade. The ground floor will be dedicated to research, and includes interview rooms and specialised testing areas, and, most importantly, a lounge and courtyard area especially for the Study members. This area has appropriately been named "The Phil Silva Research Suite" in honour of the Study's Founding Director. The first floor is for offices and meeting rooms for researchers and support staff. Study members can expect a whole new experience when they come to the Unit for their age 45 assessments, and beyond! Director, Richie Poulton (far right) joins (from left), Founding Director, Phil Silva, Mike Colombo (Head of Psychology Department); Harlene Hayne (Vice-Chancellor); Koro Hata, the Hon. Paul Goldsmith (Tertiary Education Minister). 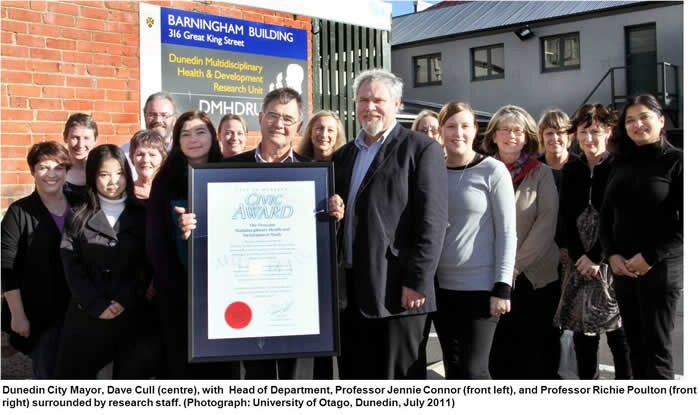 Professor Richie Poulton, Directory of the Dunedin Multidisciplinary Health and Development Unit, recently accepted a civic award on behalf of the study members from the Dunedin City Mayor, Dave Cull.